during the hydrolytic rancidification and lipid oxidation of edible oils. 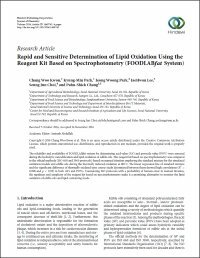 oxidation models and edible oils during the thermally induced oxidation at 180°C. oxidation of edible oils and lipid-containing foods. 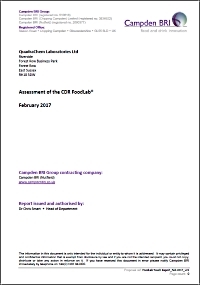 The international reference laboratory Campden Bri has trialled the CDR FoodLab® to establish whether it could meet the requirements for analysing a number of important food quality parameters. assessment of the ability of the CDR FoodLab® to analyse for Anisidine Value, Peroxide Value and Free Fatty Acid content showed that the instrument gave comparable results to the reference methods with very high correlation coefficients suggesting good accuracy of results. 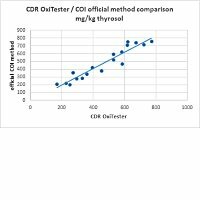 The new Total Polyphenol (Biophenol) test used by the CDR OxiTester has been tuned to the reference method COI/T.20/Doc. no. 29: 2009 by the Merceological Chemical Laboratory of Florence; the total olive oil polyphenol assay results as obtained by the CDR OxiTester method are in good accord with the values obtained by the reference method. The international reference laboratory Campden Bri analyzing a number of important beer and wort quality parameters as: ph, bitterness, colour and alcohol, realized a comparison study between CDR BeerLab® analytics methods and reference methods. From July through October 2001, Standard Latte Laboratory, which is part of the Associazione Italiana Allevatori (Italian Breeders Association) ran 2,500 tests in order to check FoodLab method in determining the amount of urea in the milk of cows, buffalos and sheeps. This test validates the analysis method of all the analysis systems of the FoodLab Line, the FoodLab method, comprising the new versions of the systems: CDR BeerLab® and Junior, WineLab Touch, FoodLab Touch and FoodLab Touch for fats and oils. WineLab is the preceding version of the CDR WineLab® analysis systems, CDR WineLab® and WineLab Junior. The versions of the systems share the same analysis method, the CDR WineLab® method. This method has been validated by ISVEA. In collaboration with Parmalat S.p.A., CDR conducted a comparative study between the specific electrode and FoodLab methods in determining the amount of ammonia in whole and skimmed milk. Neotron, an italian accredited laboratory, conducted a study with the aim of comparing CDR FoodLab’s method for the determination of the Peroxide Value (PV) and the Free Fatty Acid (FFA) in vegetable oil matrices using ISO methods. Neotron, an accredited laboratory, conducted a study in order to compare the performance of CDR FoodLabreg;‘s method with NGD and ISO methods used to determine the level of soaps, Peroxide Value (PV) and Free Fatty Acid (FFA) in oil matrices. è una divisione CDR s.r.l.